With temperatures hovering around 3°C, rain and precious few hours of sunshine, January is a bleak month for the average UK garden. Grass growth is at its slowest and it’s too early for major lawn treatments. That said, there are still a few jobs that you can tackle in January to set yourself up for a fantastic 2019. 1: Should I mow the lawn? Whoever does the mowing in your house can look forward to an easy few weeks in January, especially if it’s frosty outside. Mowing frozen grass can cause long-term damage to your lawn, as the grass isn’t strong enough to recover at this time of the year, therefore do not mow the lawn. If you’re itching for something to do, you could always get your mower blades sharpened or take your mower in for a service. Keep an eye out for leaf debris in January. If you’ve got overhanging trees and hedges that are still shedding leaves over your lawn this month, make sure you rake up the foliage before it has a chance to settle and rot. If fallen leaves are left to sit on the grass, they’ll create the perfect environment for lawn diseases. Fallen leaves also starve your grass of precious winter sunlight. If you’ve got fruit trees in or near your lawn, January is the perfect time to prune them back. A few hours spent shaping your apple and pear trees over the next few weekends will help the surrounding grass soak up as much precious winter sunlight as possible in February and March, keeping your grass alive and your lawn looking beautiful in the spring and summer months. January is a tough month for garden birds. 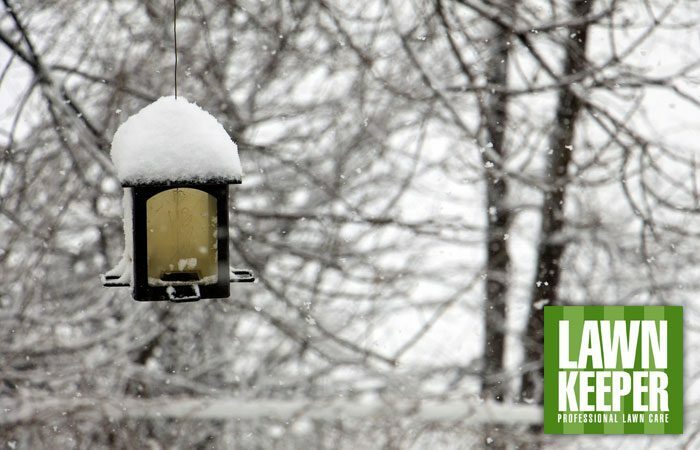 If you can, leave hardy fat balls or suet blocks in your bird feeders. The birds will remember which homes they can rely on for food, so a little investment in regular feeding now will keep your garden full of life and noise throughout spring and summer. We carry out a lot of hard surface treatments in January. Moss is a major slipping hazard, especially with the long evenings and freezing temperatures common in January, so we often spend our days brightening up our customer’s patios, paths and driveways. If you’ve got a moss problem, just give us a call – we’ll help you get rid of it. If we’re lucky enough to enjoy a frost-free January, then we’ll be able to carry out lawn treatments like moss control and aeration. The work we do in January is highly weather-dependent; interference with a dormant frozen lawn can cause more problems than it cures, so we’ll let you know what’s possible based on the weather and the underlying health of your grass. In our professional opinion, you should relax and enjoy the next few weekends as much as you can. There’ll be plenty of opportunities to get out with the lawnmower this year (…especially if you’ve signed up for our quarterly feed and weed treatment! ), so put your feet up while you still can! In the meantime, the Lawnkeeper team would like to wish you a Lush Green 2019! Happy New Year!